MRP Home encourages people, in its winter ad, to “double the snuggle” and “keep things cosy” with MRP Home winter blanckets, now subject to a great deal. “They say good things come in life in twos, like the two of us and those two cups of coffee before 7AM. Sometimes, you’ll find two little monsters in your bed for double the snuggles and two great jam stories. There are days when you stay in bed game is way too strong. So catch some ZZZ’s and save some RRR’s when you take two and save on blankets,” the voiceover says on the 30-second spot, which opens with a couple in bed, sitting under their cozy blanket and eating popcorn while watching a movie. 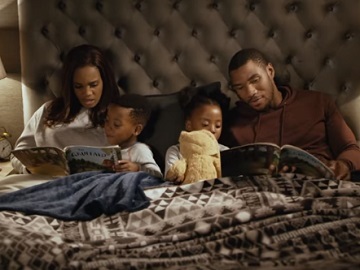 A tray with two cups of coffee on it, two adorable puppies playing under a blanket, a mother woken up by her two children, who are jumping on the bed, a little girl and her brother sitting near their parents, in their large bed, having two different stories read to them are also featured. A final onscreen line reads “take 2 and save on winter blankets from R159.99 each.” and the voiceover adds the company’s tagline, “We’ve got great value every song”.